When disaster strikes, Delta’s support helps the American Red Cross provide food, shelter and cleanup to those in need. 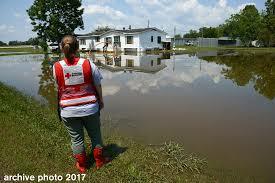 As Hurricane Michael approaches the coastline of the Panhandle of Florida, and the Red Cross prepares to respond, Delta’s support as an Annual Disaster Giving Program (ADGP) participant at the $1 million level, allows the organization to be strategic in disaster response. The American Red Cross is Delta’s longest-standing nonprofit partner, which has allowed the company, its employees and customers to help people in need for more than 75 years. In addition to ADGP funding, employees participate in corporate blood drives throughout the year, making Delta the largest corporate sponsor of American Red Cross blood drives with 11,085 pints in Fiscal Year 2018 (Year End June 30). Delta’s partnership with the Red Cross facilitates easy employee donations that can be applied to disaster relief. In 2017, Delta solicited employee contributions to relief efforts in the wake of numerous crises, including several major hurricanes, an earthquake in Mexico and unprecedented flooding in Texas.